San Pedro cactus, also known as Echinopsis pachanoi or Trichocereus pachanoi is a cactus native to the Andes which contains mescaline. San Pedro cactus generally grows to 3-6 meters, with 6-15 centimetres in diameter. 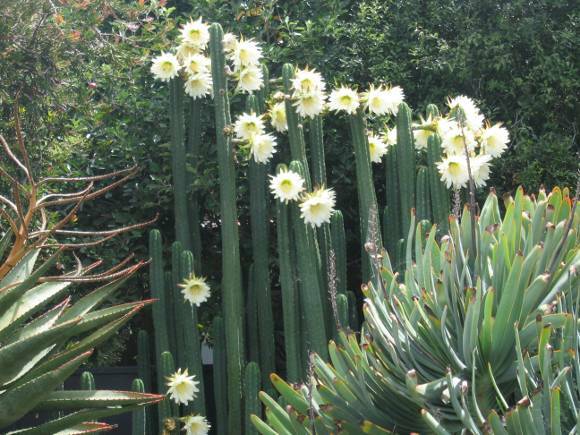 The cactus has white flowers that open at night and dark, oblong fruits. The San Pedro cactus is only one of the several plants in the Cactacaea family that contains mescaline. Others include peyote, Peruvian torch, Bolivian torch, and some other with only trace amounts. Psychedelic cacti have a long history of being used for their mescaline content by Native Americans. Nowadays it is illegal in most countries, including the USA, to extract mescaline from the plants. However, these cacti may still be grown for decorative purposes. The main active ingredient in the San Pedro cactus is mescaline or 3,4,5-trimethoxyphenethylamine. Mescaline is an alkaloid with psychedelic effects similar to LSD and psilocybin. While mescaline occurs naturally in many Cactaceae and certain Fabaceae, it is also synthetised. Mescaline is a serotonergic psychedelic, which means it binds to and activated the serotonin 5-HT2A receptor, as well as the serotonin 5-HT2C receptor. Exactly how this results in psychedelic effects is yet unclear, though but it likely involves excitation of neurons in the prefrontal cortex. Mescaline can induce a variety of physical, cognitive and visual effects. Visual hallucinations include enhanced colours and brightness, geometric forms and complex fractals. Auditory hallucinations may also occur, and synesthesia can easily be experienced with the help of music. Though the effects are rather similar to those of LSD, the kaleidoscopic visual effects manifest more clearly with eyes closed. 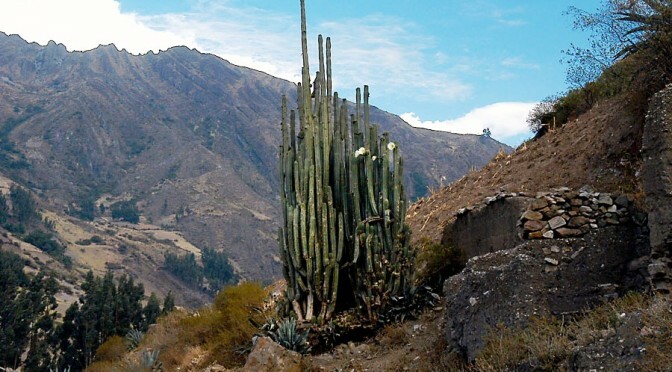 The San Pedro cactus is, in itself, not a controlled plant in most countries. Plants and seeds may be bought and cultivated for ornamental and gardening purposes. In this sense, the cactus is legal. However, the mescaline that can be extracted from San Pedro cacti is a controlled substance in most countries. As a result, extraction and possession of the mescaline content is illegal, and plants may not be cultivated for purposes of consumption. Mescaline is a psychedelic, hallucinogenic substance with widespread recreational use. Most of the effects induced by mescaline are of a cognitive nature, though there are some physical effects as well. 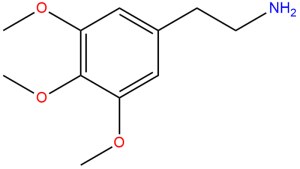 Mescaline, or 3,4,5-trimethoxyphenethylamine is a serotonergic psychedelic, which means it exerts its effects through activating the serotonin 5-HT2A receptor with a high affinity. The exact reason for the occurring psychedelic effects is unclear, as there are some 5-HT2A agonists that have no such effects. Mescaline also binds to and activates the 5-HT2C receptor. Although conceptual thinking is enhanced, mescaline use may also cause disorganised thinking, delusions, and a distorted sense of time. As with most psychedelics, mescaline causes short term memory suppression, which can lead to a disassociation from one’s self and ego death. Mescaline use is considered by many to be a spiritual experience. Mescaline is a stimulant, making users feel more energetic and motivating them to participate in various physical activities such as running or dancing. This is accompanied by an increased control over one’s body, as well as enhanced tactile sensations. Other physical effects common to psychedelic substances include wakefulness, dilated pupils and increased heart rate. Nausea is among the less enjoyable effects caused by mescaline. The most sought-after effects of the San Pedro cacti are the open and closed eye hallucinations. The visual and auditory effects occur rather consistently with mescaline use. Hallucinations can range from geometric patterns to whole scenarios. Visions are often spiritual, mystical or religious in their nature. Generally described as a positive experience, some users have reported seeing unspeakable horrors as well. The onset of mescaline takes about 40 minutes, while the primary effects themselves usually last for 8-12 hours. After effects are normally experienced for about 24 hours after the consumption. After effects of mescaline include joint stiffness, muscle aches and physical tiredness. This is the result of the body returning to its normal state from elevated blood pressure and the stimulating effect of mescaline. Other reports of after effects mention various feelings of confusion and a sort of afterglow from the effects. Insomnia is common even in the hours after the primary effects have faded. The San Pedro cactus is generally considered a relatively safe substance. A study of the Huichol Indians found no abnormalities, even though the subjects took Peyote an average of 35 times a year all through their adult lives. Another study was conducted on members of the Native American Church. With a sample group of about 30 000 mescaline users, one of every 70 000 ingestion was categorised as a “bad trip”. Mescaline also causes no physical addiction. There have been no reports of overdose effects or lethal consequences of mescaline use. The LD50 for rats is about 800-1200 mg/kg orally. This means it would take several times the strong dose of mescaline to be lethal to humans. Still, caution should be exercised when consuming larger doses. San Pedro cacti has been used for its supposed healing properties for thousands of years. However, there is no reliable research on what its exact health benefits include. The cactus is consumed in the form of a tea. The San Pedro cactus is also believed to have an enlightening effect, as the experience is often considered spiritual or even divine. According to the anecdotes, the name of the plant itself is a reference to Saint Peter, who holds the keys to heaven. There have been many suggestions regarding the potential medical uses of mescaline, including treatment of alcoholism and depression. However, due mainly to its legal status, very little research has been conducted on the substance. There are various ways to prepare and consume San Pedro cacti. The cactus’ flesh may be chewed raw, though this method is a rather difficult and unpopular way of ingestion. Another method is to remove the skin of the plant along with the needles, and cut its flesh off the central “spine”. The cactus is then pulverized, and either taken with water or in the form of capsules. The most popular way to consume San Pedro cactus is by brewing a sort of tea. With this method, the skin, needles and such does not need to be removed (as they will be filtered out). 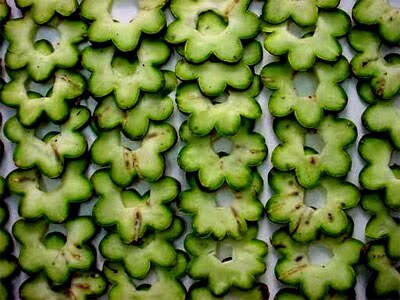 First, a section of the cactus is cut up into slices (like a cucumber). then it is further cut up in order to fit in a blender; and blended along with water of the same amount as the cactus. The blend is cooked on low heat and stirred regularly until the mixture is even. First the cactus pulp separates from the water, but then the two are combined again; watch out for spillage. The heat can be increased until the brew simmers. The concoction is brewed for another 2-4 hours. Add water as necessary; by the end about 12-16 ounces (350-450 grams) should remain. Filter through natural fabric into another pot. Leave the goo in the fabric (e.g. piece of a T-shirt) to cool, then squeeze the rest of the liquid into the pot. The remaining pulp can be discarded. Drink the juice extracted from the cactus. It still has a rather unpleasant taste, so a chaser is recommended. Still, by removing the need to chew the foul-tasting plant itself, the resulting nausea may be lessened, especially if drunk slowly. Recipe by John W. Allen (Erowid). The threshold amount for mescaline is 100 milligrams, while up to 1000 mg is considered a heavy dose. Though the lethal dose is much higher than that, users should be extremely cautious with amounts over 1000 mg.
“People took on the strange quality that they do on acid, and I found myself staring at them in wonder. After a few minutes of wandering around, we decided to sit down on a secluded bank of the river and watch the ducks. My wife and brother fed them bread as I watched them swimming around, and I started to see them as if for the first time – they seemed like quite amazing creatures, and seemed to fit their environment so perfectly. Everything seemed to be moving slowly, the sun was catching in our eyes and I started having some pretty intense open-eyed visuals, which were much more psychedelic than I had expected – similar in intensity to the visuals I have had on acid, but somehow more fluid while retaining a sharp geometrical structure. I practiced meditation for many years and would say that the San Pedro experience has helped me knock down a few walls blocking the path to understanding the nature of one’s mind and being. With San Pedro, I have experienced myself as a being connecting earth to heaven, I have experienced ‘myself’ in many different times and places in the past…a past which is taking place simultaneously with the present. I have experienced the the entirety of the universe and everything in it as a nearly egoless ‘me’. San Pedro cactus is only one of the legal highs included in Simon’s legal high guide, check out the others as well. Last updated: 2015. 11. 16. A guide detailing the properties, effects and legal status of the San Pedro cactus, including trip reports. Great explanation of the legality of san pedro cactus. It’s important to realize what’s allowed and what’s not so that you can enjoy your plants in peace. Thanks so much for sharing!